Category: Bellamy's. Tags: Bellamy's, Organic, Step 3, Toddler. Bellamy’s Organic Toddler Milk Drink is a nutritious supplement to the broadening diet of busy toddlers! Made from certified organic cow’s milk, it contains added iron, and 16 other essential vitamins and minerals to support the rapid growth of your child. Our Toddler Milk also contains inulin – a natural prebiotic fibre, which stimulates good bacteria for a healthy digestive system. Our Toddler Milk drink is a preferred alternative to pure cow’s milk when weaning toddlers from breast milk or infant formula. 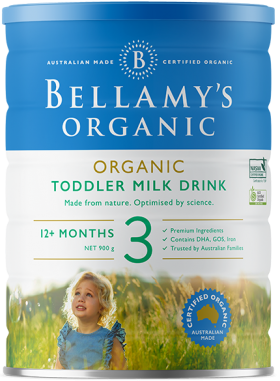 Bellamy’s Organic Toddler milk is made to the very strict regulations of Australian and New Zealand Food Standards (FSANZ). Our formulas and milks are certified organic by the National Association of Agriculture Australia (NASAA Certified Organic), Australia’s leading national certifier. Our Toddler Milk is also Halal certified by the Islamic Co-ordinating Council of Victoria (ICCV). Our tin will provide you with the necessary measuring scoop and preparation instructions, along with a feeding table to guide you on how much your toddler will need each day. Bellamy’s Organic. A pure start to life. Ingredients: Organic full cream milk powder, organic skim milk powder, organic maltodextrin, organic demineralised whey solids, organic lactose, organic soybean oil, inulin, organic sucrose, lecithin (soy). Total certified ingredient = 95% MINERALS: Calcium phosphate, magnesium sulphate, sodium citrate, ferrous sulphate, zinc sulphate, potassium iodide. VITAMINS: Vitamin C, niacinamide (vitamin B3), vitamin E, vitamin D3, vitamin A acetate, pyridoxine hydrochloride (vitamin B6), thiamine hydrochloride (vitamin B1), folic acid (vitamin B9). Allergens: Contains milk and soybean products. Always wash hands before preparing. Wash and rinse cup or bottle and all utensils thoroughly. Fill scoop and level off using the levelling blade on the tin. To 1 cup of drinking water (200ml) add 4 scoops (34g) of Bellamy’s Organic Toddler Milk Drink. Whisk, shake or stir the mixture briskly until powder dissolves. * Always add one level scoop (8.5g) of powder to each 50 mL of drinking water.